An opportunity to acquire or take a joint venture position in one of Brisbane’s most prominent residential development sites is to be offered to the market. The Fortitude Valley site is located at 188 Wickham Street site, in the city’s bustling Chinatown precinct. It has development approval for 324 apartments in a twin-tower project known as the W188 Towers. Interested parties will have the ability to acquire the site outright or take a joint venture position to develop the site alongside Singaporean based investment and development company, Heeton Holdings. CBRE’s Darren Collins, Michael Platsis and Mike Walsh have been appointed to steer the campaign, which is expected to attract wide ranging interest. 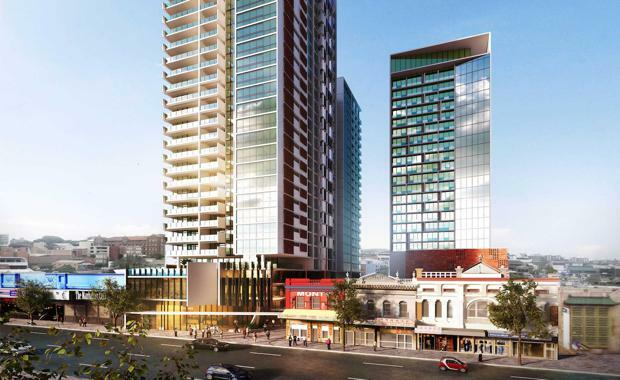 “We expect buyer interest will come from both onshore and offshore developers looking to acquire one of the last large infill sites in the heart of Fortitude Valley’s Chinatown precinct,” Mr Collins said. Designed by Australian architects Nettleton Tribe, the W188 scheme provides 28 metres of frontage to Wickham Street. It is opposite Chinatown Mall and within a short walk of the Fortitude Valley railway station. CBRE’s Mr Platsis said the existing planning approval would be one of the key buyer draw cards, providing planning certainty and offering speed to market. “Whilst the Brisbane high density market is currently in the process of absorbing a substantial amount of supply, this presents a rare opportunity to acquire a substantial Chinatown site in the heart of Fortitude Valley,” he said. The first stage of W188 consists of 187 apartments and the second is comprised of 137 apartments plus 297 square metres of prime ground floor retail. The towers will offer city views to the south and Storey Bridge views to the east and will provide parking for 316 cars. The project is also designed to incorporate substantial communal space for residents, with a pool, lounge and gym areas, function space and garden areas. An open-air plaza at ground level is designed to draw pedestrians across the site with the inclusion of retail space, bars and restaurants – tapping into the existing laneway culture of Fortitude Valley.